It may sound simple, but what Owen has created is the first organized cardiac registry of its kind in the country. A Watsi-funded patient recovering in the ICU after a successful cardiac surgery. This part covers some background and context behind where I was and why. If you’d rather get to the juicy stuff, feel free to skip down to part 1! Last November, I spent my two-month mark at Watsi discovering the poorest country in the western hemisphere. Watsi’s mission is to bring basic healthcare to every person in the world, and we figured that surgeries would be a good place to start. Luckily for us, NGO hospitals have already been doing amazing work in bringing surgeries to the people who need it the most. However, NGO hospitals have a million and one problems to worry about: coordinating care in some of the world’s most challenging settings, financing populations who often can’t afford to pay, utilizing technology where there may not even be a reliable power-source, and trying to expand capacity each year despite all of this. What we at Watsi try to do is to cover both their financing and tech. But to cover the finances and tech of a NGO partner, we need to understand the world they operate in. We need to see how they coordinate care, what their patient processes look like, how they raise and spend their money, and what technologies their hospitals have. In short, like with any product, to build something great, you need to understand your users. To understand our users, we need to go to them — even if they’re halfway around the world. That one’s for our partners. The other reason we go on these trips is to make sure they’re absolutely meticulous with the money we send over — that one’s for our donors. So why Haiti? Actually, wait…where is that again? Unless you’ve had some prior exposure to Haiti, a quick 101 would probably help. Somehow despite my 16+ years of American education, I wasn’t even sure where the country was, let alone an expert on its state of healthcare. I was admittedly a little embarrassed about this until quite a few of my friends (also with 16+ years of American education) asked me when I’d be back from Africa. Haiti ranks dead last on the Human Development Index for the Western hemisphere. No, that is not Threadless T-shirts sales for the last quarter. It’s the complete graph of Haiti’s exports. And healthcare? There are 25 physicians per 100,000 people and about 5 western-standard hospitals for the entire country of 10.6 million. Most of the population live in small huts in non-fertile mountainous areas, 2–3 hours away from even the nearest drug dispensary. ****. Why is Haiti so poor? History isn’t so simple though; for a more in-depth and nuanced discussion, I’d suggest this post if you’re interested. Oh…that might explain a few things. I didn’t even have space to mention how desertification has destroyed the country’s once-fertile landscape, or how the import of cheaply subsidized U.S. rice has devastated the local agriculture. Despite Haiti’s heavy history and staggering numbers, my time there was far from depressing. It was marked by the absolutely remarkable people I met who have dedicated their talents and lives to improving the state of the country. Humid morning in Port-au-Prince. I head down to the hotel lobby, where the rest of my team and I are greeted by a thin man with a soft smile. His name is Owen, the founder and director of one of the NGO partners we’ll be visiting. He motions for us to follow him into his van. Today, he’ll show us a day in his life. 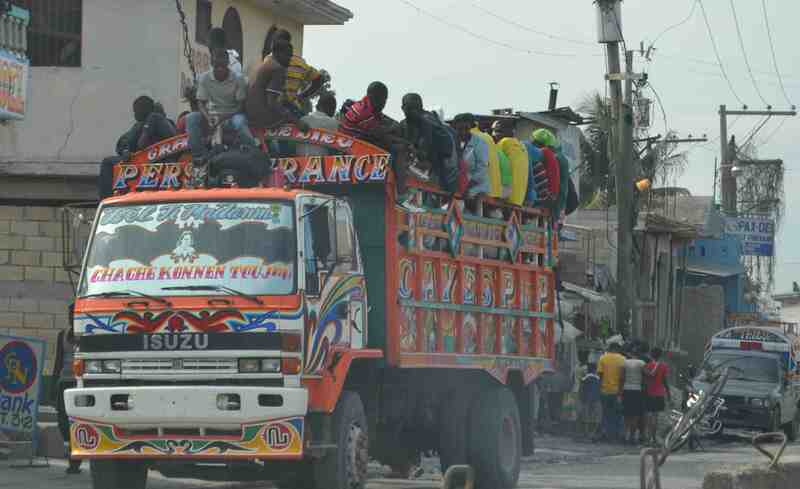 Owen navigates us through the chaotic morning traffic of Port-au-Prince, where the streets often have no lanes and the intersections no lights. Decaying trash and burnt tires from political protests litter the sides of the roads. We enter a sea of repainted pickup trucks packed with locals, while waves of school children in uniforms ebb in and out around us on the way to class. Meanwhile, their older siblings and parents run errands and begin setting up wares for the day. A Haitian share taxi, also known as a “tap-tap”. Between the bump-bump-bumps of the car ride, I learn more about Owen’s story. After a dual degree at Harvard and a few years in consulting, Owen left his comfortable lifestyle to pursue his passion for global health. He worked first for the Clinton Initiative and then Partners In Health, where he oversaw the building and launching of Haiti’s largest and most advanced hospital to-date. These days, he’s the one-man operation behind his own nonprofit, Haiti Cardiac Alliance, where he works to bring cardiac surgeries to all the children in the country with life-threatening heart conditions. Owen at work in his diagnostic clinic. St. Damien’s Pediatric Hospital, Port-au-Prince. I felt quite safe with Owen — not only because he’s self-mastered the native Creole language, but also because the one time we went to a gas station and was greeted by a security guard with a shotgun (as it turns out in Haiti, anything remotely of value is guarded by one), it turned out that he just wanted to thank Owen again for saving his son’s life. 40 minutes and half a million bumps later, we pull into the dusty front entrance of St. Damien’s Pediatric Hospital. “They’re with me,” said Owen in Creole to the security guards. They nod and quickly let us through. St. Damien’s Pediatric Hospital (source). Port-au-Prince, Haiti. As we follow Owen through the front doors of the hospital, the decaying and dusty streets of the city quickly transform into a clean and well-lit lobby. Colorful hallways stretch in both directions, encircling two beautiful squares of greenery. We follow Owen, nodding respectfully to the local nurses and staff as we pass, until we reach a door with a small red crab hanging outside. We’ve arrived at the diagnostics clinic of the Haiti Cardiac Alliance. To our surprise, a little boy not even two years old was already waiting inside. Garlens, a true champ at the age of 2. “Garlens!” Owen exclaims, his face immediately lighting up. He engages in cheery Creole conversation the mother, filling us in on the boy’s remarkable story between his exchanges. Garlens was one of Owen’s cases from earlier that year. He was born with a serious congenital heart defect, making him so oxygen-deprived that he had only a few months to live. If he’d been born a few hundred miles north in the U.S., he would’ve been diagnosed with “total anomalous pulmonary vein return” and gotten surgery immediately. But in Haiti, there are no post-birth diagnostics and no cardiac surgeons. For months, Garlens struggled to move and breathe, slowly dying, until his mother heard word that a man at a clinic in St. Damien’s was seeing children who were blue and sickly like him. On the day the clinic opened, his mother carried him to the hospital, where she waited on a long line with other parents and sickly children. Garlens was eventually brought into the room where we were sitting now, where a team of volunteer nurses and doctors examined his heart under ultrasound imaging. They told his mother that he had at most a few weeks left and offered something that had never been possible before: a spot on a waiting list for a cardiac surgery. Garlens had been given a chance to live, but the list was long — over 200 children — and the next available surgery wasn’t for 2–3 months. He needed to fight for that chance, and he did just that. Garlens somehow managed to survive not only the long months leading up to his surgery, but also the complex operation itself. (You can actually see a of him right after his surgery here.) Today, he’s alive and kicking — and back for a follow-up visit. “Where does Watsi come into all of this?” I asked Owen. Even though I’d been working there for 2 months, I didn’t quite understand how all the pieces came together. Owen pulled out his laptop. Owen (left), showing two of our team the pediatric cardiac registry he’s started from scratch. He proceeded to show us an absolutely meticulous database of all the hundreds of patients he’s diagnosed with cardiac conditions: extensive medical and personal information about each one, a triaged waiting list for those who still need surgery, and most impressively, extended follow-up data of the patients for years after their surgery. It may sound simple, but what Owen has created is the first organized cardiac registry of its kind in the country. Right now, he’s doing it all in a few spreadsheets. But as we expand the tools we have for our partners, we can become a comprehensive patient management system that’ll allow them to scale from hundreds to thousands. 10 AM hits, and Owen’s cardiac diagnostics clinic opens again. As parents and children begin filling the hallways outside, Owen gets to work with a few local coordinators. Garlens and his mother waited on a line much like this one for a chance at life. Owen at work with local coordinators. And that’s the end of part 1! In part 2, I’ll show you what the rest of the pediatric hospital (and an open heart surgery) look like!